We will celebrate world palliative care day with a talk on this year's theme: "Do not leave those who suffer behind." 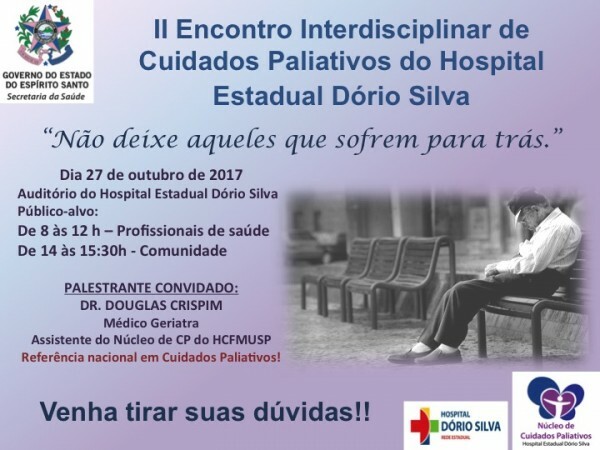 The subject will be discussed during the II Interdisciplinary Meeting of Palliative Care of the State Hospital Dório Silva (HEDS). The event will take place next Friday (27), and from 8 am to 12 noon the discussions will be for health professionals, and from 2 pm to 3:30 pm, for the community.